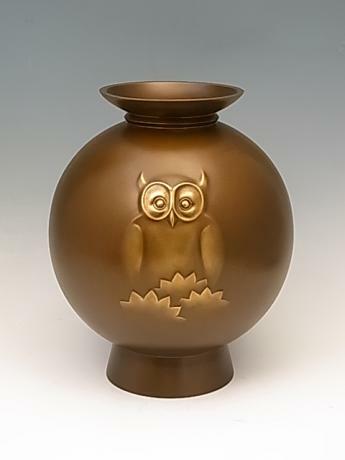 Japanese Showa Period bronze vase with plant and lady bug design by metal artist, SHIMADA SOUGO. SHIMADA SOUGO was born in 1940 and studied under his father. He first exhibited at the prestigious NITTEN exhibition in 1959. He lives and works in Takaoka City, Japan. 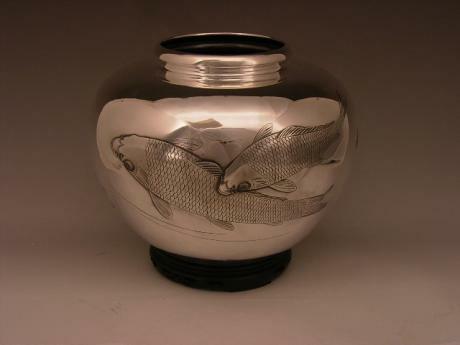 The vase is signed SOUGO in back..
Japanese Meiji Period silver vase with KOI design. The KOI are done beautifully with a lot of detail and realism. The bottom of the vase is marked JUNGIN, pure silver and SHO for SHOBIDO. SHOBIDO was the name of a famous shop that dealt with works of art and high end luxury items. 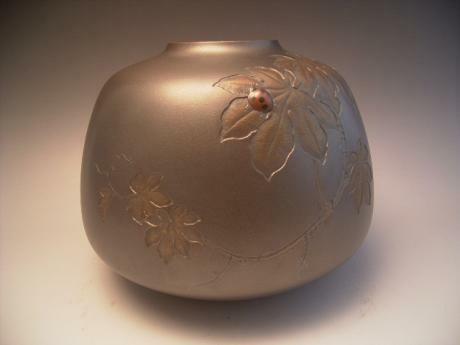 This vase cam..
Japanese Showa Period bronze vase with plant and lady bug design by metal artist, SHIMADA SOUGO. 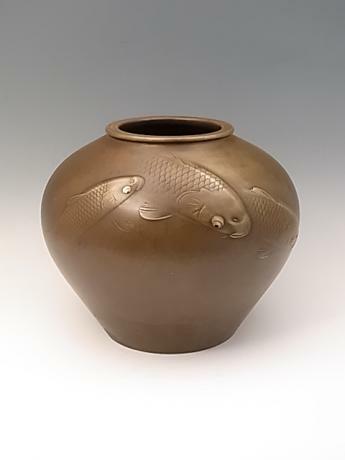 SHIMADA SOUGO was born in 1940 and studied under his father. He first exhibited at the prestigious NITTEN exhibition in 1959. He lives and works in Takaoka City, Japan. 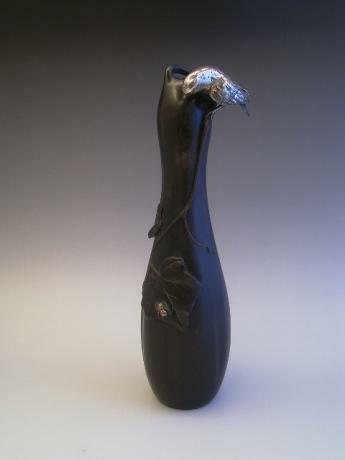 The vase is signed SOUGO in ..
Japanese Meiji Period bronze vase with clad silver bird and spider. The gourd shaped vase has the clad silver bird perched on top eying the clad silver spider on a leaf below. Beautifully rendered with wonderful detail and expression. Name of artist, BIKOKU on the bottom. 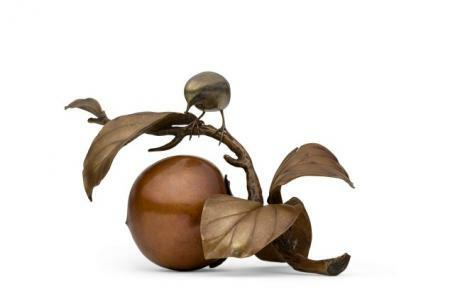 The vase measures 10 1..
Japanese circa 1900 bronze and mixed metal book marker. 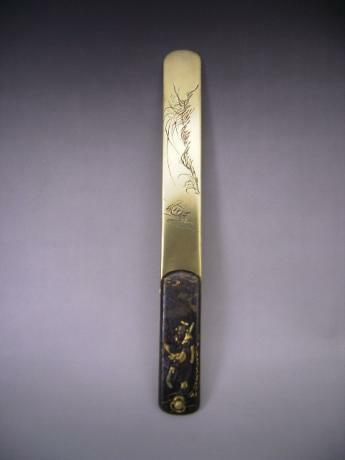 The blade of the book marker is done in a yellow bronze with a design of cymbidium orchid and a crab etched into the metal. 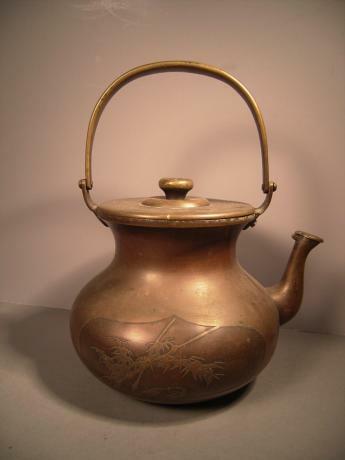 The handle is done in mixed metals with the design of a Chinese general with a long spear standing next to a pine tr..
Japanese Meiji Period teapot. The teapot has the design of florals and birds. THe teapot measures 9" tall (from base to top of upright handle), 7" wide and 6" in diameter. Japanese mid 20th century iron card box with lid by metal artist IMAOJI NAGAMITSU from Kyoto. THe box is dated 1947. 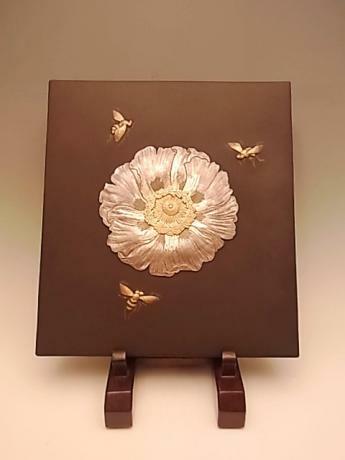 The box has a peony and bee (3) design done in high relief. The box comes with exhibition catalogue and TOMOBAKO, or original artist signed wooden storage box. The box measures .. Copyrights 2019 Oriental treasure box. All rights reserved.